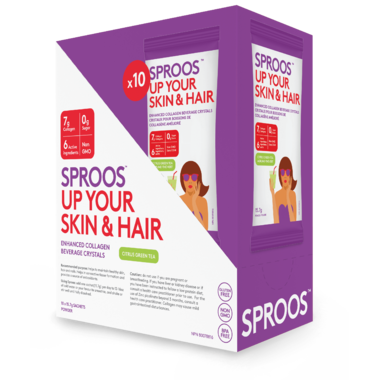 Sproos™ Up Your Skin & Hair is a synergistic combination of 6 active ingredients (wild-caught marine collagen, organic acerola (Vitamin C) hyaluronic acid, zinc, silica and biotin) designed to work meaningfully from within to improve the appearance of dull, aging skin and hair. This powerful formula delivers a unique blend of antioxidant, anti-inflammatory and regenerative effects. 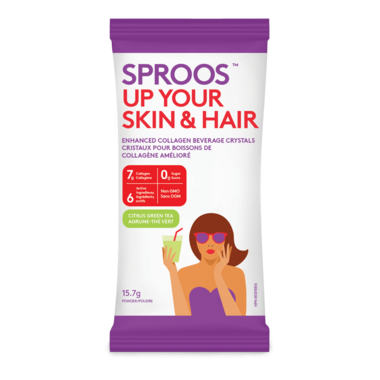 Take one scoop daily, added to a glass of water, to enhance your skin and hair health. Directions: Add one sachet per day to 12-16oz of cold or warm water or your favourite smoothie, and shake or stir well until fully dissolved. Caution: Do not use if you are pregnant or breastfeeding. If you have liver or kidney disease or if you have been instructed to follow a low protein diet, consult a health care practitioner prior to use. For the use of Zinc picolinate beyond 3 months, consult a health care practitioner. 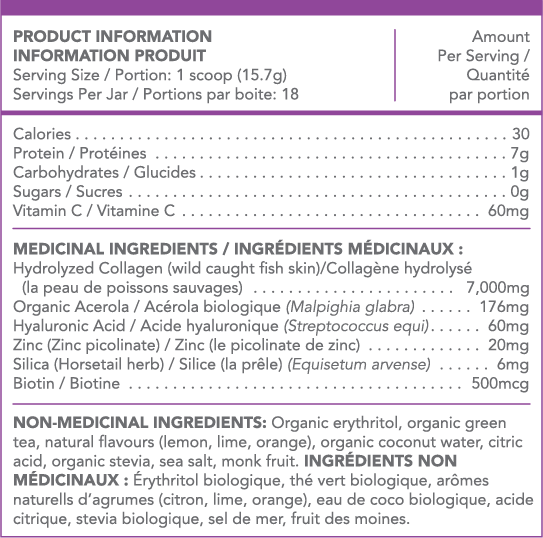 Collagen may cause mild gastrointestinal disturbances.